en su hábitat natural, en la zona Habana-Matanzas, sobre un erizo en el seibadal. Foto: Ángel Fernández. Type locality: Lessina [Hvar Island, Croatia] (Kützing 1843: 307). Type: L? Europe: Adriatic Sea (Giaccone 1978, Ercegovic 1980, Gallardo et al. 1993), Balearic Islands (Dao 1957, Ribera Siguán & Gómez Garreta 1985, Ballesteros 1992, Gallardo et al. 1993, Joher et al. 2012), Corsica (Boudouresque & Perret 1977, Coppejans 1979, Gallardo et al. 1993, Rodríguez Prieto, Boudouresque & Marcot-Coqueugniot 1993), France (Feldmann 1937, Augier, Boudouresque & Laborel 1971, Coppejans 1972, Gallardo et al. 1993, Anon. 2017), Greece (Gerloff & Geissler 1974, Haritonidis & Tsekos 1976, Tsekos & Haritonidis 1977, Athanasiadis 1987, Gallardo et al. 1993, Tsirika & Haritonidis 2005, Tsiamis et al. ), Italy (Giaccone 1969, Cinelli 1971, Edwards et al. 1975, Cinelli et al. 1976, Gallardo et al. 1993, Gallardo et al. 1993, Cecere et al. 1996, Furnari, Cormaci & Serio 1999, Rindi, Sartoni & Cinelli 2002, Serio et al 2006), Malta (Cormaci et al. 1997), Spain (Romero Martinengo & Romero Martinengo 1982, Ballesteros 1983, Pérez-Ruzafa & Honrubia 1984, Gallardo et al. 1985, Rodriguez Prieto & Polo Alberti 1988, Soto & Conde 1989, Gallardo et al. 1993, Flores-Moya et al. 1994, Flores-Moya et al. 1995, Invernón et al. 2009, Hernández et al. 2010), Spain (incl. Canary Is.) (Gallardo et al. 2016), Turkey (Europe) (Güner, Aysel, Sukatar & Öztürk 1985, Gallardo et al. 1993, Zeybek, Güner & Aysel 1993, Taskin et al. 2008 ). Atlantic Islands: Ascension (John et al. 2004), Azores (Tittley & Neto 2005, Parente), Bermuda (Taylor 1960, Schneider 2003), Canary Islands (Gil-Rodríguez & Afonso-Carrillo 1980, Haroun et al. 2002, Aldanondo-Aristizábal, Domínguez-Alvarez & Gil-Rodríguez 2003, Gil-Rodríguez et al. 2003, John et al. 2004, Anon. 2011, Afonso-Carrillo 2014), Madeira (Neto, Cravo & Haroun 2001), Salvage Islands (Audiffred & Weisscher 1984, John et al. 2004). North America: Florida (FL) (Taylor 1928, Taylor 1960), Texas (TX) (Wynne 2009). Central America: Belize (Norris & Bucher 1982, Littler & Littler 1997), Mexico (Pacific) (Pedroche et al. 2005, Pedroche et al. 2005), Panama (Wysor & Kooistra 2003). Caribbean Islands: Bahamas (Taylor 1960, Norris & Olsen 1991), Barbados (Taylor 1969), Caribbean (Littler & Littler 2000), Cayman Islands (Taylor 1960), Cuba (Taylor 1960, Suárez 2005, Gonzáles et al. 2014, Suárez, Martínez-Daranas & Alfonso 2014, Martínez-Daranas et al. 2018), Curaçao (Fricke et al. 2018), Hispaniola (Taylor 1960), Jamaica (Taylor 1960), Lesser Antilles (Taylor 1969), Martinique (Delnatte & Wynne 2016), St. Eustatius (van der Loos & Prud'homme van Reine 2015, van der Loos et al. 2017), Trinidad & Tobago (Duncan & Lee Lum 2006), Virgin Islands (Taylor 1960). South America: Brazil (Oliveira Filho 1977, Villaca et al. 2010, Moura 2010), Venezuela (Ganesan 1990). Africa: Algeria (Gallardo et al. 1993), Egypt (Papenfuss 1968, Aleem 1993, Gallardo et al. 1993), Egypt (Mediterranean) (Shabaka 2018), Kenya (Silva, Basson & Moe 1996, Bolton, Oyieke & Gwanda 2007), Libya (Gallardo et al. 1993), Madagascar (Silva, Basson & Moe 1996), Mauritius (Silva, Basson & Moe 1996), Morocco (Gallardo et al. 1993, Benhissoune, Boudouresque & Verlaque 2001, Benhissoune, Boudouresque & Verlaque 2001, Moussa et al. 2018), Mozambique (Silva, Basson & Moe 1996), South Africa (Silva, Basson & Moe 1996, Leliaert & Coppejans 2004, Coppejans, Leliaert & Verbruggen 2005), Tanzania (incl. Zanzibar) (Silva, Basson & Moe 1996, Oliveira, Österlund & Mtolera 2005), Tunisia (Meñez & Mathieson 1981, Ben Maiz, Boudouresque & Quahchi 1987, Gallardo et al. 1993). Indian Ocean Islands: Comoros and Mayotte (Han et al. 2015). South-west Asia: Levant states (Gallardo et al. 1993), Oman (Wynne 2018), Turkey (Asia) (Taskin et al. 2008 ). Asia: Japan (Okamura 1936, Segawa 1981, Yoshida, Nakajima & Nakata 1990, Yoshida 1998, Elvira et al. 2012, Yoshida, Suzuki & Yoshinaga 2015), South China Sea (Phang et al. 2016), Yonaguni Island (Titlyanov et al. 2016). South-east Asia: Indonesia (Verheij & Prud'homme van Reine 1993, Atmadja & Prud'homme van Reine 2014), Myanmar (Burma) (Soe-Htun et al. 2009), Philippines (Silva, Meñez & Moe 1987, Ang, Sin Man Leung & Mei Mei Choi 2014), Vietnam (Tien 2007, Nguyen et al. 2013). Australia and New Zealand: Houtman Abrolhos (Huisman 1997), New South Wales (Millar & Kraft 1994, Huisman 2000), Queensland (Lewis 1987, Phillips 1997, Phillips 2002, Bostock & Holland 2010), Western Australia (Huisman & Walker 1990, Huisman 2000). Pacific Islands: American Samoa (Skelton et al. 2004), Central Polynesia (Tsuda & Walsh 2013), Fiji (South & Skelton 2003, Littler & Littler 2003), French Polynesia (Payri, N'Yeurt & Orempuller 2000), Jarvis I. 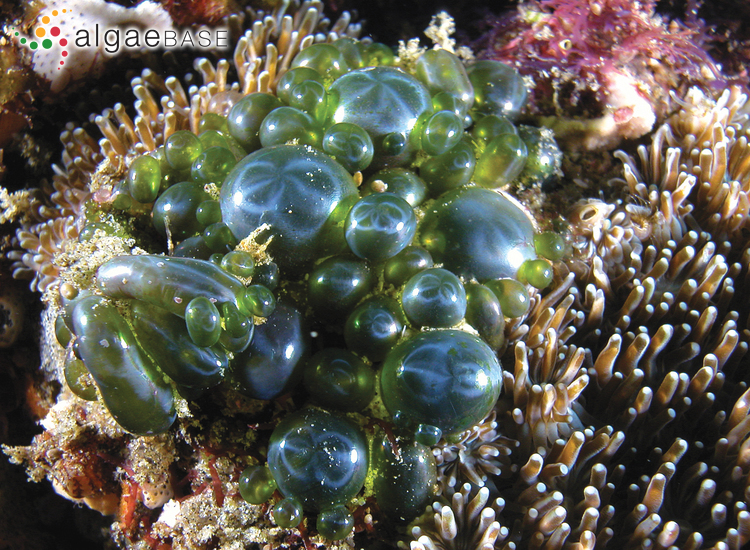 & Kingman Reef (Tsuda & Fisher 2012), New Caledonia (Payri 2007). Accesses: This record has been accessed by users 4158 times since it was created. Chihara, M. (1954). 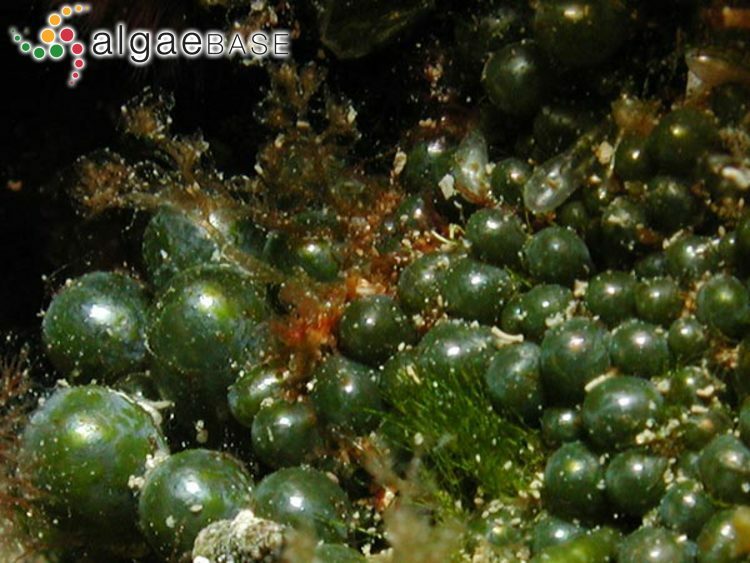 Studies on the life-history of the green algae in the warm seas around Japan (1): On the life-history of Valonia macrophysa Kütz. Journal of Japanese Botany 28(12): 353-361. Chihara, M. (1959). 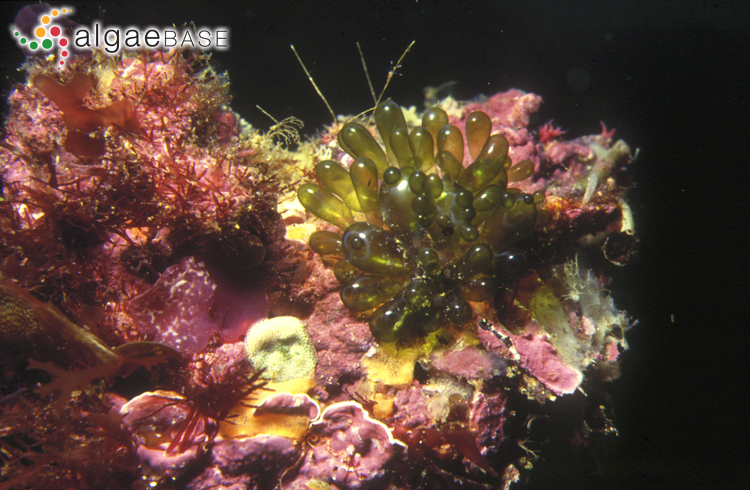 Studies on the life history of the green algae in the warm seas around Japan (9). Supplementary note on the life history of Valonia macrophysa Kütz. Japanese Journal of Botany 34(9): 257-266. Guggino, S. & Gutknecht, J. (1982). 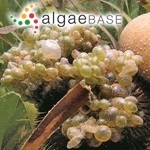 Turgor regulation in Valonia macrophysa following osmotic shock. J. Mem. Biol. 67: 155-164. Hastings, D.F. & Gutknecht, J. (1976). 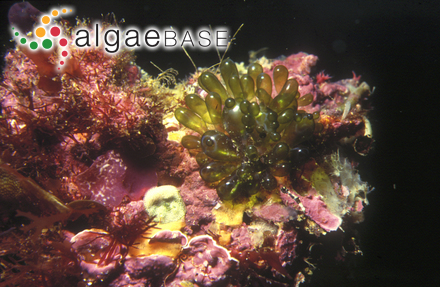 Ionic relations and the regulation of turgor pressure in the marine alga, Valonia macrophysa. J. Membrane Biol. 28: 263-275. Staves, M.P. & La Claire, J.W., II (1985). 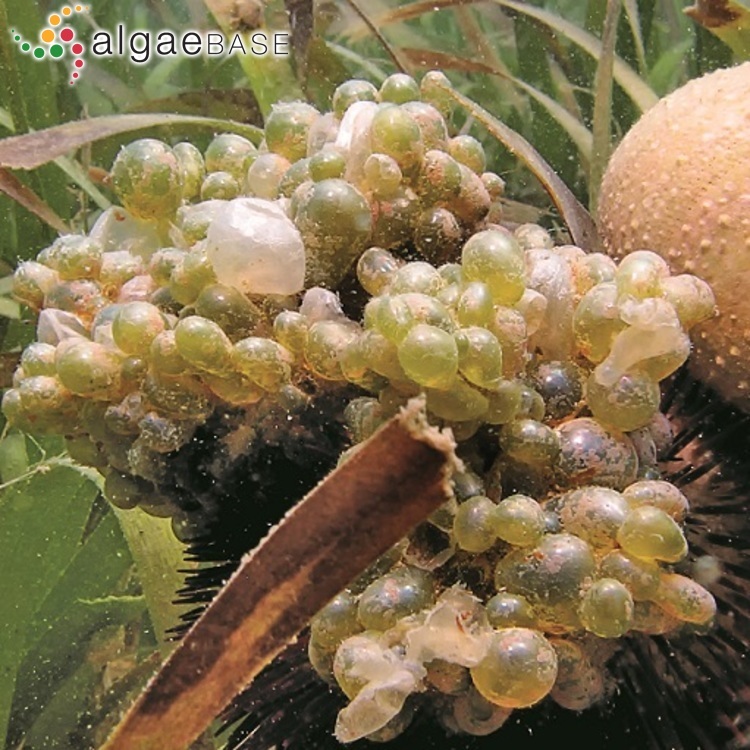 Nuclear synchrony in Valonia macrophysa (Chlorophyta): light microscopy and flow cytometry. Journal of Phycology 21: 68-71, 2 figs. Sugiyama, J., Harada, H., Fujiyoshi, Y. & Uyeda, N. (1985). Lattice images from ultrathin sections of cellulose microfibrils in the cell wall of Valonia macrophysa Kütz.. Planta 166: 161-168.